I've gone back and added some images from our meal to my post above. They were captured by my friend Eliot Wexler, whose photog skills are wonderful and greatly appreciated. 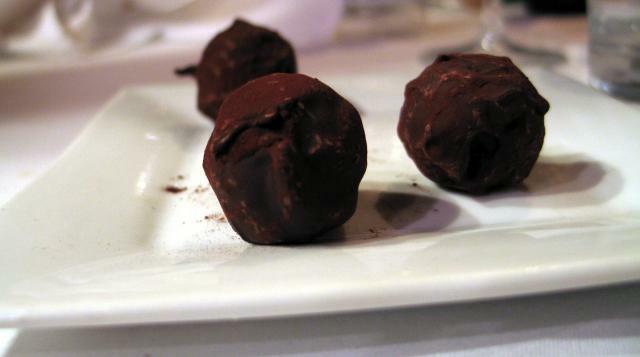 And I did forget to mention our final, final bites which were some delicious, handmade chocolate-peanut truffles. Here's a picture of them . . .
Last night we had the pleasure of getting a preview of what’s in store for white truffle season this year at Sweets & Savories (in the spirit of full disclosure this meal was comped by the restaurant, but I would gladly pay full price for it any day of the week). First course – Brandade & Vichyssoise (paired with Tokay Pinot Gris, Wolfberger, France 1999). The brandade was served on crostini which was balanced on top of a tall, thin glass of vichyssoise. I’m a huge fan of both of these items at Sweets & Savories, so they were only enhanced with the addition of shaved white truffles on top. My only quibble with this dish is that the vichyssoise had a bit of oil (can’t remember if it was olive oil or truffle oil) that had been poured into the top of the glass, so the first sip was really a mouthful of oil and not soup. The rest of the glass was fantastic though. The wine had a nice sweetness that worked well against the brandade. A nicely done, smaller version of a classic. A single poached egg served on top of a larger crostini with some frisee and a bit of bacon. Between the perfectly runny egg and the addition of shaved truffle, I was a very happy man. This could have used more bacon (really, what couldn’t?). I actually would have been a lot happier with lardoons, but what can you do. Third course – Seared scallop served on top of “duck liver” risotto with a mango coulis (paired with Vouvray Demi Sec, Yves Bruessin, France 2005). Death, taxes, and outstanding scallops at Sweets & Savories. I’m always excited to have scallops here because Chef Richards really has a way with them. Plump, slightly browned on the outside but absolutely perfectly cooked on the inside this scallop was a real treat. The risotto speaks for itself, adding a wonderful richness to the dish, with the mango coulis providing just the right amount of sweet/tart notes to bring the whole dish into balance. I would gladly eat this even without the truffles. One of my two favorite dishes of the night. Fourth course - Alaskan Halibut Sous Vide, served over a truffle potato pauve with sauce Periguord (paired with Merlot, Hawkes, California 2002). I felt this dish was the closest we got to average over the course of the night. I’m just not really a fan of fish prepared sous vide (on the other hand, I love meat prepared this way). The halibut was a gorgeous piece of fish, but it just didn’t do it for me as much as the other courses. The potato pauve was fantastic, and if there’s one thing I like at Sweets & Savories more than scallops it is Chef Richard’s sauce Periguord. Fifth course – Beef Tenderloin with White Truffle Butter, Lobster, Corn and Cremini Mushroom Ragout served with Maytag Blue Cheese Crease (paired with Barolo, Elio Grasso, Italy 2001). My other favorite dish of the night, maybe the favorite dish of the night. The beef was served a perfect rare to medium rare and just sung when paired with the white truffle butter and the blue cheese cream. The beef was served with perfectly cooked lobster claws that added a nice amount of sweetness to the dish along with the corn. The lobster also added a nice salty note to the whole thing. I’m probably not doing it justice, but this was about as good of a “surf and turf” dish as you’ll find anywhere. The Barolo was easily the star wine of the night. We all remarked that it was a real treat to be able to enjoy it with this course. OK, first of all, I’m completely convinced that Chef Richard’s is putting crack in the white truffle ice cream. I was introduced to it a couple of years ago and I absolutely crave the stuff at all times. Last night it was fantastic as always. Honestly, words cannot describe how much I love this ice cream. If not for the ice cream, the best thing on the plate might have been the “duck liver” caramel. We were all scraping our plates to get every drop of the sweet, salty, and just slightly liver-y concoction off of our plates. Oh yeah, and the peach tart was pretty good too. Again, just a fantastic dinner. I believe during truffle season they will be offering a 5 course white truffle dinner for $100 per person. Given what some of the higher end restaurants in town will likely be charging, this is a steal if you need your white truffle fix. God, I love the white truffle ice cream. Sous vide, huh. I don't recall chef preparing things sous vide. Oh man, I have been there in a while. I think it is time to take a return trip. This sounds much better than the last white truffle I had there a while back. Thanx Josh. Yeah, this was my first encounter with sous vide at S&S too. It definitely struck me when I saw the menu. So, how can *I* get S&S to comp me a 6 course white truffle meal? going to s&s for the first time tonight, in about an hour or so, anything I can't miss? Get the tasting menu and you should have a great meal. Otherwise, go for the burger, any type of risotto, or any scallop dish. So, what's the current state of the burger at S&S? I haven't been since the foie ban went into effect, and I was wondering how they were getting around the issue or have modified the dish. I just called S & S to see if we could get a reservation this evening. The kid "Garret" told me that they were booked up this evening and would not be able to take any walk-ins. Just to be clear I said "so you're telling me that I can't come to eat there tonight?" and he said "Yes - that is correct." mellonhead wrote: I just called S & S to see if we could get a reservation this evening. The kid "Garret" told me that they were booked up this evening and would not be able to take any walk-ins. Well, if they really are that busy, it was nice of him to be up front with you, rather than mislead you into coming over and having to wait a long time to eat in a restaurant that was already booked beyond capacity. As many times as I've been to S&S's though, it's never been that busy, so it does seem odd. OTOH, I'm usually there on weeknights. It seems odd to me they'd turn away business like that. Are you incredulous that S & S in particular would "turn away business"? Or are you incredulous that any restaurant would? Because (I could be wrong about this, but) it seems to me entirely expectable that a restaurant could be completely booked and have not a table to spare. If I called and was told there were no tables, it wouldn't occur to me to ask the same question again as if there would be a different answer the second time. They must have a large party, I was there on a Friday night recently and there was no danger of filling up. It's a small restaurant. It's a Friday night. It happens. jesteinf wrote: It's a small restaurant. It's a Friday night. It happens. Yup, it's happened to me on one occasion where I arrived without calling ahead...and that instance was on a Thursday night. Granted, they were gracious enough to offer me a complimentary drink and a plate of Kumamotos at the bar, but I was somewhat wedged-in and wasn't able to get a complete meal, nor would there have been sufficient room to enjoy it properly. In your position, mellonhead, I'd at least be glad I learned about their full house *before* walking in their door. muddpuddle wrote: So, what's the current state of the burger at S&S? I haven't been since the foie ban went into effect, and I was wondering how they were getting around the issue or have modified the dish. I hear you Riddle. It's not that they said they were full - I realize that this place is kind of small and things like that do happen - it's the 'tude that miffed me. I've never had someone tell me that they couldn't seat me without a reasonable explanation. The inflexibility was what really baffled me...if they're booked because of a large party or something, just tell me - it's a way more reasonable answer than telling someone that they can't eat there. This is not the first time that I've had a host at S & S tell me they were booked and couldn't seat me. Chef Richard PM'd me and was nice enough to offer an explanation of what was happening on Friday evening. I appreciate that very much...I just thought it was odd that this was the second time that service at S & S has tried to turn me away. I didn't know if it was just me, or if this was a regular thing. It's never happened anywhere else in the 12 years I've lived here. mellonhead wrote: I hear you Riddle. It's not that they said they were full - I realize that this place is kind of small and things like that do happen - it's the 'tude that miffed me. I've never had someone tell me that they couldn't seat me without a reasonable explanation. The inflexibility was what really baffled me...if they're booked because of a large party or something, just tell me - it's a way more reasonable answer than telling someone that they can't eat there. And now I hear you, too. I didn't get from your previous post that there was 'tude involved. (Truth be told, rereading it, I still don't--so I'm glad you added that.) I agree that a little warmth on the phone from a place that wants to be a "nice neighborhood restaurant" (the OP's words, I realize, not S&S's, but I think they would agree with the aspiration) wouldn't be out of order. But it's probably more in the tone of voice than in any additional "explanation" offered or not offered. When I have called a popular restaurant and been told that a reservation wasn't possible, I don't recall ever being given (or desiring) an extra "reason"--the obvious (if implicit) reason is that the restaurant is all booked. No further detail is necessary, as far as I'm concerned. I assume they wouldn't be telling me there's no table available for any other, ulterior, reason. I do want the person on the phone to tell me the bad news in a nice tone of voice, however, one that implies that he or she regrets that no reservation is possible. Perhaps it was a perceived lack of regret that bothered you more than anything else. As someone who has worked at Sweets and Savories, I can offer you an explanation as to why people are regularly turned away when the restaurant is half empty. David Richards is a borderline maniac who enjoys intimidating his staff, and when he's in a particularly sour mood, the manager, Paul, instructs the waitstaff not to take any more tables until he calms down. I remember turning people down for brunch at 11:00 with only 2 reservations on the books because David was already throwing plates around the kitchen! Another complaint I've often read is regarding the breakneck speed at which courses are served, particularly at brunch; the waitstaff has no control over the pacing, because if David wants to send a course out 2 minutes after the previous course has gone out there's no arguing with him, unless you'd like to be fired on the spot. We would actually hide food behind the bar until the guests were ready for it, rather than deal with him! That also explains the high turnover and perceived inexperience and "'tude" of the staff; they are dealing with a boss who does not value them (& often doesn't pay them, either!). Granted, the food is pretty good, but as one of the cooks there told me, "You can drown anything in duck fat and truffle oil and it's going to be tasty!" Last edited by charmattack on January 5th, 2008, 9:35 pm, edited 1 time in total. do they have a weekend brunch? seems like the type of place that would have a very good one. If you read the first page of this thread, then you fill several reports on brunches at S&S. I dined at S&S last night for the first time, with a friend of mine. I was pretty disappointed with the experience as a whole. The food was excellent, I had the sea scallops, and my friend had the seafood stew, but the service was beyond bad. I read a few posts up that, at times, the course timing is often off. This was the case Saturday. We were barely through our appetizers when our entrees arrived. When placing our order, the server left the table mid-order, to go get something at the bar. In my mind, not the type of service you'd expect or want from a place that charges between $20 - $30 for an entree. I don't know that I'd return. A lovely dining room, and great food, but the service has the ability to make the whole experience a bit stressful, jarring, and unenjoyable. As a side note, we were in and out within an hour, which is also stunning to me as there were no reservations after ours, nor was there much of a walk in business. I just wanted to post about my recent experience at S&S and reaffirm my love for this restaurant! To clarify, my only dining experiences here have been on Monday, for their $10 off the tasting menu and no corkage fee BYOB special. For the benefit of those who might not be familiar, S&S has a very limited a la carte menu on Mondays because of their tasting menu special. The tasting menu is not published, so it's just a surprise when it comes out to the table, which is fun for me, maybe not so for others. (I'm sure you could get a preview by calling ahead, in case you have concerns) I observed while I was there that the two servers tended to get a little prickly when the other diners were not aware about the tasting menu format and wanted a la carte, and even more so when the diners would advise them of allergies that they did not highlight when they made the reservation. So - a word to the wise, if you go on Monday, the entire table should be prepared to eat a 5 or 8 course tasting menu, or you might have a less than spectacular experience with the service. The Significant Other and I went on Monday with a nice bottle of champagne and were ready to eat whatever was put in front of us. We left very full and incredibly happy after completing the 8 course tasting. 1: Grilled octopus salad. The octopus was really tender and delicious! 2: Mushroom ravioli. This came in some sort of broth, that I didn't quite catch the description of, but the ravioli was really creamy, also delicious! 3: Grilled scallop with duck liver risotto and mango coulis. I thought we were already excited, but then this came out! This was awesome. I couldn't believe how well all the flavors went together. 4: Salmon with beef short rib and yukon gold potatoes. Again, awesome blend of flavors. They called it their "surf and turf." 5: Lamb with eggplant "relish" (for lack of the proper word) - I don't know much about the preparation of this dish, but suffice it to say this was really good. 6: Salad - kind of like a Ceasar-ish salad. Could have done without this, because it didn't do so well as a palate cleanser. 8: Apple turnover with blue cheese - again, not a huge fan of cheese, so I didn't much like the small bits of blue cheese. Again, I picked those out, and the rest was completely fantastic. I finished mine and ate the rest of my dining partner's dessert! The 8 course tasting menu was $65 (on Monday) and was definitely one of the best meals I've had in a long time. Service was great, but again, we "knew the drill." jn2001 wrote: 3: Grilled scallop with duck liver risotto and mango coulis. I thought we were already excited, but then this came out! This was awesome. I couldn't believe how well all the flavors went together. I've had that dish before. It is absolutely outstanding. When is the "restaurant week menu" in effect? Is it available to any customer? Sorry, that would have been helpful. The menu will be offered 1/27 - 2/3. It is available to any customer as long as you know the secret password, which is "Chad rules!". Sorry...just kidding on that last part. I'm a fan of S&S, and especially of chef David, as I've noted in other threads such as this one. The place is too expensive to make me a regular, so I was really excited when David joined the 20.08 deal noted above. The actual experience was a major letdown. I'd have found the bisque overly, cloyingly sweet even if it had been pie filling - as a starter it was nearly impossible to eat. The salmon was severely overcooked. I really wish S&S had not participated in that Restaurant Week, if this was the effort they were going to put forth. It has left me with a sour taste for a place I had formerly admired greatly. I'll almost certainly be back again, as I know from experience that David is a talented chef who cooks my kind of food. But I'll be in no rush, and it won't be for anything that sounds like a gimmicky marketing idea. Kennyz wrote: The place is too expensive to make me a regular, so I was really excited when David joined the 20.08 deal noted above. The actual experience was a major letdown. I have to disagree. My s/o ordered the bisque and I enjoyed my small taste of it, while my husband loved it. I ordered the arugula and it was fine, but nothing special. We enjoyed both entrees--I had the wild mushroom risotto with Danish blue cheese and it was perfectly balanced and oh-so-rich. The s/o had the beef shortribs with potatoes and he found it enjoyable and satisfying. Our desserts--lemon mousse and bread pudding were good--though we preferred the lemon dessert. It was light and fresh after the rich entrees. The bread pudding just seemed a little heavy after the earlier rich dishes. My only complaint is the pacing, which is a common S & S complaint. It was too fast. All in all I felt it was well worth the price of $20.08. There were other options from the regular menu and there was the chef's tasting menu available as well. Last edited by Food Nut on February 19th, 2008, 9:34 am, edited 1 time in total.